I find that the Japanese, myself included, use the phrase, "Japan is the world's second largest GDP" as some sort of mantra to try to keep Japan relevant in a world that is exceedingly uninterested in Japan. I was talking to Oki Matsumoto, a good friend and the CEO of Monex about this. He told me about a talk he gave at Keio University about the increasing irrelevance of Japan and showed me the following slides which I post with permission. This first slide is the percentage of the world GDP of various countries in 2004 and projected in 2050. On the far left is the US at 38.3% in 2004 and a diminished but significant 20.3% in 2050. Japan however goes from 15.4% in 2004 to 4% in 2050. Still 2X that of Italy's projection, but not the mammoth we seem to think will will continue to be. The first yellow block is China and the second one is India. Clearly they are the big growth markets according to the predictions. You may say, well that's 2050. That's a long time from now. The second image shows Japanese GDP plotted from 1980 to 2006. It shows our once 18% GDP down to a a modest 9.1% in 2006. Furthermore, the text on the right explains that we've gone from the world's highest GDP per capita to the world's 18th. It's really no wonder we're having a hard time getting attention in Japan. With an aging population and a less-than-competitive economy, there are ways to manage, but you don't get there by denying the facts and continuing to beat you chest IMHO. De-va-stating. I'd love to see Matsumoto-san do that presentation in person. The trick with this kind of message is that it's just as easy to generate ennui or depression as it is to generate activity. How can you take what is really a negative message and create positive activity from that? That's the challenge. My soap box would be something like this: "With an aging population and a less-than-competitive economy, there are ways to manage, but you don't get there by denying the facts and continuing to" invest in the manufacturing sector. Perhaps just as worrying as the GDP drop is the collision course this is taking with the massive debt that is going to need to be paid off. (Those unnecessary roads that construction companies like mine continue to build don't grow on trees.) A substantial hike in taxes is inevitable. I think people pay too much attention to the GDP, contrary to the reality: mass-to-individual trend. Focusing on the national GDP too much is a sign of backward thinking, group mentality that contains the source of nationalism. It is fun to observe the GDP number including people's reaction, though. I'd rather use the statistics to consider how my own small community can survive. The second image shows GDP *as a percentage of world GDP* from 1980 to 2006, right? If so, there appears to be a different number for 2004 as compared to the first slide. Apply the same forecasting methodology (which you have not explained) to a snapshot of Japan in 1930. How accurate a picture would this methodology produce of 1970 Japan? My guess is that most of the results would be way off base because of the catastrophic or unexpected events that have occurred in the intervening 40-year period. So what is it about these people that forecast the future that makes them think that all catastrophic/unexpected events will stop, thereby rendering their forecasts accurate for the first time ever? These factors that nobody can predict will completely determine the future. Sean: Good catch. Must be different sources or ways of counting. boo: agree with your point. However, the graph of the historical trend is probably pretty accurate and still depicts a rather bleak trend compared. Isaac: True. 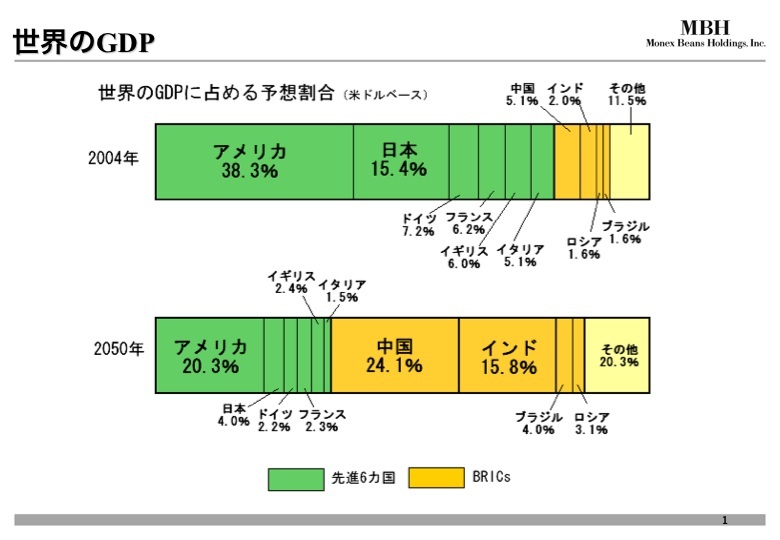 My point here is really that Japanese should stop using the phrase, "but we're the second largest GDP!" as some sort of slogan... and as you point out, it's possible that focusing on China's growing GDP might not necessarily be the most productive thing to be focusing on either. I wonder how this plays out in the context of the whole China/Japan tension thing. I can only say that the bubble economy in the 1980s was a just another hype for the entire nation of Japan. We're just another nation now. What's wrong with it? The percentage to the world GDP is not only the metric of the nation's power, let alone the wealth. Japanese companies should focus on entering the Chinese/Asian market and having good relationships with his neighbors, that in the future are gonna be more relevant than the US. Another way to increase the GDP would be to promote more tourism and make this country more friendly to foreigners. Euro-Yen rate is bringing lots of European people lately to Japan. Japanese people should focus on having better standards of life with less daily stress and more family life. I believe a socialist government for I while good do really good. With a socialist government Japan should try to become something like Sweden, Finland or Norway but with a more powerful culture. One thing that China doesn't have yet is a powerful pop culture. Japan has many international well known icons: manga, anime, otaku, j-pop, cosplay, samurai, geisha... Japanese should try to export more this culture. I wonder if Mr Matsumoto's projections are based on "business as usuall" projections. By that I mean, assuming there are no increasing environmental pressures to make drastic changes in the way we develop and manufacture goods in the next 42 years (most certainly there WILL be). One reason that china and india are so powerful now, is that it is that one of the ecnomic barriers to producing the goods in Japan and US is the growing awareness of negative environmental (and social) effects, and regulations that prevent "cost efficient" (cheap) production at home. I know that they will continue to gain economic power in the coming years, but forty years from now is a LOOOOOOONG time. Before then, environmental problems will be much more understood and visible, and we will no longer be able to just outsource all the dirty work and pretend it doesn't effect us. At some point, even China and India will feel the pinch, and the playing field will be leveled? - or maybe Japan (can't speak for US) will have cought on and will have developed superior methods to meet needs without screwing the environment? I have no economics learning, and i may be way off base, but this is what I thought when I saw a projection of fifty years out. Any idea if the China projections are based on the recently downwardly revised ones or if they use the older GDP measurements? These things can be so tricky if you dont know where the numbers come from. I think its far easier to generate ennui than excitement. On the positive side, do you see a large enough group of young, Japanese entrepreneurs in tech and other fields to make a difference here? Where should investors look to potentially re-invigorate the Japanese economy? This was a presentation by Oki to a bunch of Japanese economics students. I'm sure he picked up the numbers from some published report. I don't think the point is whether these numbers are accurate, but that they're considered accurate by some people - by a large number of people. I think the point he was trying to make and that I'm trying to make here is directed more at a the Japanese who continue to think that they can flaunt their GDP and economic size as if it were #2 and huge. The fact is that no one believes it anymore. I think, as others have said in this thread, that the economy growth/super-power message that was the battlecry of the LDP and post-war Japan needs to change to something a bit more normal and humble. I think the message is provokating. I think the game for Japanese has been completely changed long time and very few of us are aware of it. We should mind. To be blunt, I'm not seeing much interesting business happening here that isnt the same old "me too" stuff thats been going on since the Meiji Restoration. In fact I'm seeing some of the same old sneaky moves by the government to hold off innovative foreign business models *just* long enough for domestic under performers to copy in a chuto hampa way. I cant go into the details now, but its like the famous story about the foreign ski manufacturer. As long as the command and control economic model persists, I think the country will indeed be second rate. The overseas tourism idea wont survive after the Pound and Euro loose some strength, the reasons are many. The entertainment export business will probably maintain continued weak growth despite the domestic reluctance to actually develop it as a proper industry. Overall though I think its a good thing for the bubble mentality to die off. Its holding the nation back in too many ways. Thanks for posting this. Interesting data. I realized even with all the future implications, however, according to the slides, claiming that "Japan is the world's second largest GDP" appears to be accurate now and for many years to come. I wonder if there's a relevant way of measuring "critical" economic activity versus "less critical" or "non-strategic." Japan, in its (relatively) diminishing capacity, it about to take the top spot in automobiles, is a major subcontractor for all the important sectors in the aerospace (commercial and military) industry, is strong in greentech, is great in some areas of software, etc. Japan doesn't look like the up-and-coming empire any more, but that's partially because they've already arrived. Both China and India have massive infrastructure, political, and military issues that suggest the probability of bumpy development growth and even the possibility of major disrailment over a half century time frame. That's hard to quantify with numbers. The projection may not happen and most likely will not happen. 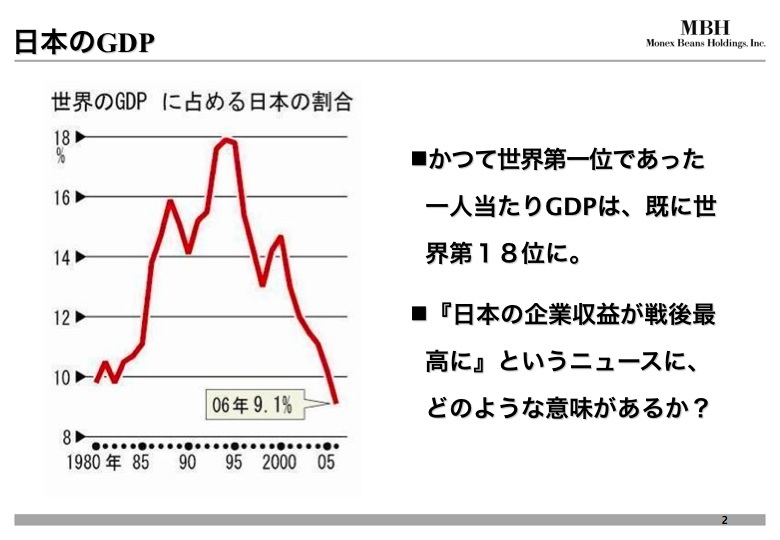 In late 1980s a famous US futurist predicted that Japan's GNP will exceed US's based upon a linear extraporation. Japan has a structual problem of declining population because they do not take any immigrants unlike US and Europian countries. Japan's GNP growth will be very low in the future. In order to expand GNP as rapidly as predicted, China and India need rapid expanded use of energy per capita and for the countries; increased energy needs for China and India are huge. They also have to overcome their structual and political problems. There will be declining availability of conventional energy source and very likely slow growth of uncoventional energy source such as renewable energy for many years. Linear extraporation of current trends leads to very high GNPs for China and India, but enrgy source to support their expansions will become increasingly difiicult to obtain and expensive. Outcome will be most likely slower growth for China and India than predicted. Per capita GNP, or degree of "civilization" is almost proportional to per capita use of energy. A king of ancient country has enjoyed good civilized life based upon energy provided by mens, such as slaves. Average Americans enjoy the most "civilization" because they use the most energy per capita. I find it hard to believe that the world is "increasingly less interested in Japan." The bubble-burst economy is over, culturally Japan's media is extending well outside Japan and its influence seems to be growing, not shrinking. China and India have sprung up as major economies, true. But that's not to say Japan is weak. I don't know the relative importance of J-economy in the years to come (nobody knows), but I can percieve the incressing 'unnecessariness' of Japan in the world. If tomorrow Japan disappeared, the rest of the world wouldn't probably notice it, and would even increase the success of other western nations. Why? because Japan only sells to the rest of the world! there's no need of Japan as long as we can always find an alternative provider, and there's not much influence of Japan Thought in the rest of the world, apart from a few silly cartoons. Yes, they sell cars (I prefer German ones) and some other useless stuff (video games), but they don't provide any other interesting contribution to the world's knowledge: philosophy ?? art ?? architecture ?? movies and entertainment ?? literature ?? where is the Japanese point of view? nowhere. That's why Japan is irrelevant to the rest of the world, or at most as important as other far smaller nations. James: While I agree that Japan does not seem to have a degree of cultural influence equal to that of their economic influence, I for once see that as a GOOD thing. There does not need to be the degree of intolerance, brutality and cultural imperialism exhibited by the United States (and European nations before that). Why do you wish this from Japan? I don't think you can be serious when you say Japan has not provided an "interesting contribution" to art. If you think its contribution to literature is lacking, then you must have extremely high standards. Not only was the world's first novel written in Japan (The Tale of Genji in 1021), but Japan has more than its fair share of highly-regarded modern authors (some of them Nobel Prize winners) including Kawabata, Abe and Mishima. I'm not a economist but just a person who living in Australia (not even an Australian myself). To me i think Japan need to develop good relationship with Asia and not to look own on other Asians as you people are Asian yourself. This will help Japan to rebuild its national reputation which is also the most important thing for a country. Promote tourism and prove to them what a wonderful country Japan is as well as going vacasion to other countries to show what wonderful you Japanese really are, not just inventing some robots and selling anime. Already in 2020, East Asia (China, Japan, Korea, Vietnam, Philippines, Thailand and others) are the largest economic group in the world. I think from 1900 to 2000 was the American century. From 2000 to 2050 is the Asian century. From 2050 to 2100 is the Indian and African century. Joi Ito - "Japan and its GDP" by Joi Ito is licensed under a Creative Commons Attribution 4.0 International License.